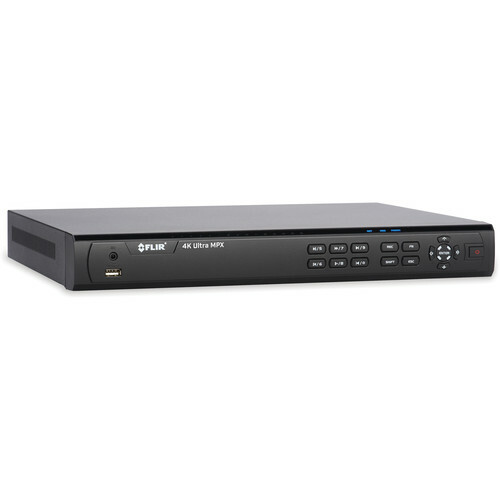 Record from and manage up to 16 cameras with the MPX Series M61164 16-Channel 4K UHD Analog DVR with 4TB HDD from FLIR. This DVR has a 4K UHD recording resolution at up to 112 fps. MPX multi-format technology offers compatibility with HD-CVI, HD-TVI, AHD, and standard analog formats via a BNC type connection. A 4TB HDD is preinstalled to save recorded footage. HDD storage capacity is expandable to 8TB. H.264+ video compression keeps file sizes manageable while maintaining quality. Two-way audio communication is possible thanks to an audio input and output. An HDMI out delivers up to 4K output resolution, and a VGA out delivers 1080p output resolution. Free FLIR Cloud apps enable remote viewing and access for iOS and Android devices, as well as Windows and Mac PCs. Box Dimensions (LxWxH) 15.0 x 12.3 x 4.9"
The picture shows a 4 chancel DVR not a16 channel. How many channels? The images are a mistake on our part. There are 16 BNC connections on this DVR.